It is very hard to find out any history of our CFS as all the past records of the old (Emergency Fire Service) EFS, belonging to the Units in the State were destroyed by some stupid person in the CFS Headquarters at Keswick, several years ago. In the olden days, before the old EFS was even thought of, the girls in the old Stirling manual telephone exchange had a list of names to ring to get as many men as possible. 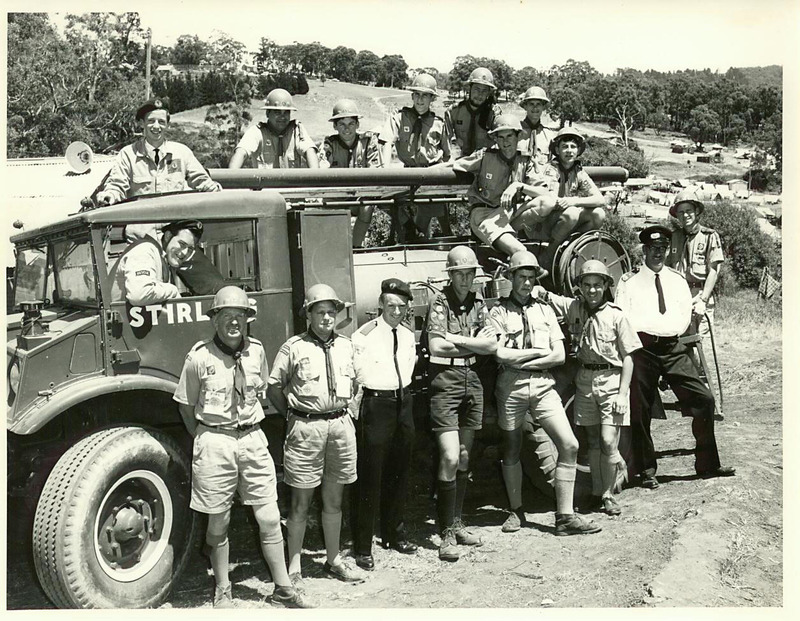 I still remember as a young boy, my late Father driving out to the fires in our old Chevvy Ute, loaded with men, wet bags, boughs and a couple of knapsacks. In fact, most of the tradespeople, market gardeners and Council employees with trucks loaded with men etc., would all be heading in the direction of the smoke. In 1947-1948, the local Sergeant of the Stirling Police Station, Mr Bob Gregory, called a meeting of ratepayers to assess the possibility of forming a local Fire Brigade. 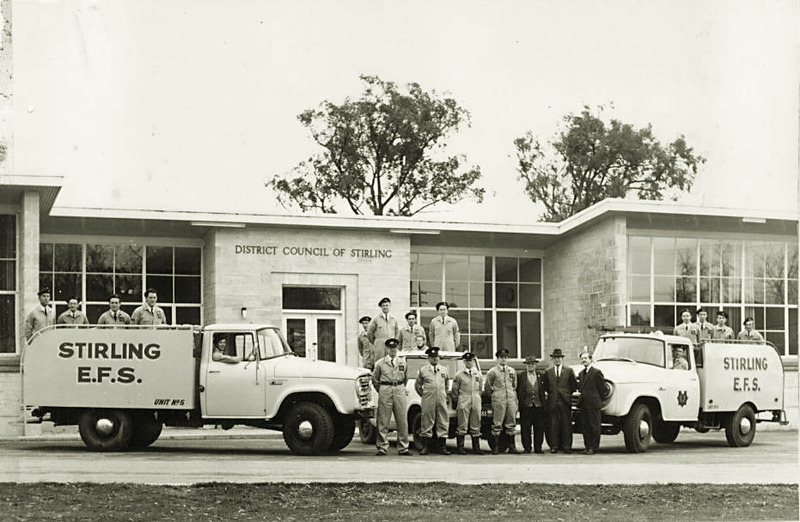 As a result the Stirling EFS was formed in May 1948, being the first EFS unit registered in our district. 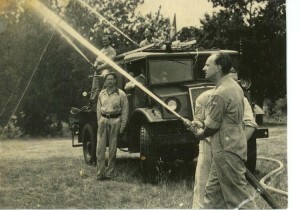 Bridgewater was the second unit registered, about 1950. 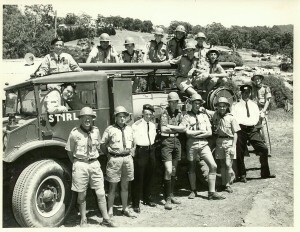 Bob Gregory and possibly others bought a Ford Blitz ex RAAF water tanker from the Gumeracha Council. It was used on an airstrip during World War 2. I believe Mr Moss Vincent, then Chairman of the Stirling Council authorised 50 Pounds towards the purchase. A Mr Bailey from the Summit Road, Crafers who was an Engineer, built the Tanker into quite an efficient and certainly a solid fire appliance. The pump was so powerful that it pushed a stream of water from the Strathalbyn Road right over the two story Aldgate Pump Hotel into the back yard. A Mr Reg Ackland who lived in the vicinity of Ackland Avenue, did the signwriting on the appliance. I believe a Council employee, the late Mr Jack Howard was it’s first driver and it was parked in the back yard of the Police Station. During the War most Councils were supplied with a Civil Defence trailer, pump and hose, so our Council gave this to the new fire service to look after. Next a Fire Station had to be built and an old “Nissen” hut and a siren was purchased from the Department of Defence and built on Council land where the present Station is now located. Under the watchful eyes of Mr Bailey, volunteers constructed the old Station, or should I say, an old shed to house the Ford Blitz and the trailer. Later a lean-to was built onto the side of the “Nissen” hut to house a second appliance. This was purchased from a Mr. Draper who ran a Cafe where “Ed Harry’s men’s wear shop is now located. It was an ex British Army ambulance fitted with an Austin Sheerline six cylinder motor, and this was also converted to a fire appliance. In fact it was so fast and powerful that we were not game to let the younger members drive it. A couple of years later a Mrs Cornell who resided on Waverley Ridge Road at Crafers and whose husband was a director of the motorbike firm Lenrocs of Pulteney Street, presented the Unit with a new Excelsior 2 stroke motor bike so the Captain or an Officer would be first to a fire to assess the situation before the other crew arrived. Some of the early members by memory were Bob Gregory, Stan Hampton, Syd Rogers, Howard and Gordon Smith, Ted Winter, Bruce Fowler, Graham Quayle, Des Rollins and Lyn Baxter (an early President), Bob Baxter (the early Secretary) and Harold Badge (the first Treasurer) who was the ES&ampA Bank Manager at Stirling, next to Chardon’s shop. Some early members from the 50’s and 60’s were Bob Hunter (our Captain for a number of years), Rudi Baltais, Rex Brinkworth (the President or Chairman), also for some years, Herman and John DeRoos, John Carver, Ken Ross, Neil Pratt who was the Secretary for a decade, Clyde Pratt, Keith Brown, Shirley and Cliff House, Brian Watts, Randell Scragg, Pierce Walker, Keith Brown, Peter Moulds (Jun), Roger Fullgrabe, Trevor Stewart, John Mott, Vince and Helen Monterola, Al Seaman, Ted Winter, Paul Ericksen, John Venus, David Beck and others. I talked my late Father to take over the Treasurer’s position as it had become vacant – he held that position for 21 years. The main source of money raised was through water carting with the Ford Tanker, which had a 500 gallon tank. Remember in those days there were no mains in the District, so the residents rainwater tanks used to run dry in the summer, so the demand for water was great. We used to fill the Tanker from the Council bore and the overhead tank in Druid’s Avenue, opposite the Deli and the now CFS Region One office. Neil Pratt, our then Secretary had a roster drawn, so our members had the old Blitz out every night of the week, including weekends delivering the much needed liquid. When my Father took over the Treasurer’s position in 1958 the Unit was broke, so he organised a huge Bonfire for November 11 on the Crafers “Oval” (Atkinson’s Paddock). The freeway now goes through the site. He arranged with the PMG – ETSA and the Council to dump their old tree branches from lopping on the oval some months before, so they would be nice and dry for Guy Fawkes night. This first night was so successful that it became an annual affair with stalls, sideshows, marching girls, displays etc. Fireworks were on sale and were let off under supervision – by now this had become a huge family evening. Choats Bus Service ran special buses up from Adelaide; including a bus for the South Australian Railways Band who played every year. Then the Miss Mt Lofty Quest was started in conjunction with the Bonfire evening and that really took on. It was lovely to see all the local girls dressed up in their best, holding a large number and being paraded on the long catwalk for the judging. In one of our photo albums at the Fire Station there is a photo of Julie Munn of Crafers on our fire appliance in the fire procession down King William Street as the “Miss Mt Lofty” for that year. These nights raised so much money that we purchased several International fire appliances over the years, but alas all good things come to an end and the Highways Department built the SE Freeway through the site. We transferred it all down to the Stirling Oval, but it was not the same as we were not permitted to build a Bonfire on the Oval for obvious reasons. Other fund raising projects we were involved in for several years. We had a contract with Lasscock’s Nurseries to tie and wrap up young trees in potting mix and plastic. This used to take two full weekends as thousands of young trees arrived from Interstate by a huge semi trailer. This job was done at the old Stirling East school sheds on the Old Mt Barker Road. Another fundraiser in the late 80’s and early 90’s was tree felling. Trees that were riddled with white ants, including 8 large gum trees at Carrick Hill at Springfield – but because of insurance problems we had to cease this way of raising cash. We also do security patrols such as the Mt Lofty Tourist Association annual “black tie” dinner at the Summit, staying at the large marquee all night. In 1994 our Committee decided to construct a large recycling shed behind the Fire Station for the receiving of bottles, beverage cans etc., which the general public drop off. This raises several thousands of dollars for new equipment every year. In fact the Brigade won a commendation award from KESAB in the Tidy Towns contest in 1995 for the best kept recycling shed in the district. Also, we have an annual Letter Appeal through Crafers and Stirling, telling the residents what we have done over the year and how we have spent our cash. 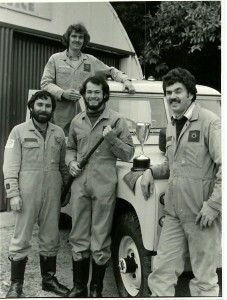 The name of the EFS was changed to the Country Fire Service (CFS) in 1976. Our present Station was built and opened by the former State Director of the EFS/CFS, Mr Fred Kerr A.M., M.B.E on March 24, 1979. Incidentally, the late Syd Rogers and Harry Quayle were our first Life Members awarded in recognition for their outstanding service to our fire service in the District. The Stirling CFS is recognised as being one of the top ten stations in South Australia. It is the District’s Road Accident Rescue and one of the few Hazchem Units in the State. Last year, 1995/96 we received 163 call outs. These days our members are trained as professionals to such a degree that when the Metropolitan Fire Service have any major incidents, Stirling is one of the Units to be on standby at Glen Osmond and Wakefield Street Stations and we have attended fires in the city. Two of our appliances and crews were sent to the Blue Mountains in the large convoy of CFS trucks that left for NSW in January 1994. In recognition of our help in saving the town of Winmalee, the NSW Bush Fire Brigade sent us a certificate of appreciation. We have an Auxiliary of non firefighting members both male and female who can operate the radio base, cut sandwiches and prepare food for members who are out on incidents for some hours. There are plenty of jobs that can be found for anyone who is interested. I would like to thank Charlie Rosewarne, Bob Hunter, Howard Smith, Ted Winter and Cliff House for their memories of the days of the old Stirling EFS.